Today on Martha Bakes, take your bread baking skills to the next level with everything you need to know to make three boulangerie quality breads: a crusty golden brown artisanal boule, a unique “edible landscape” onion and leek focaccia, and a buttery, multi-layered brioche feuilletée. 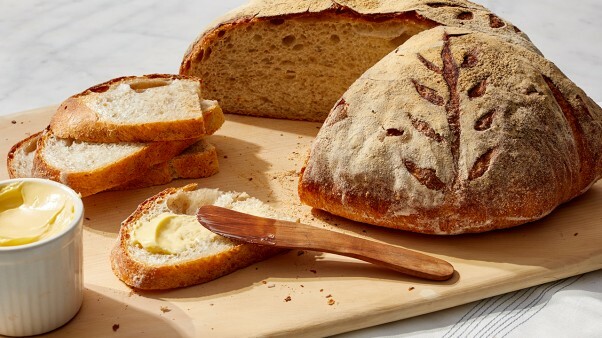 Breads so remarkable your family and friends won’t believe you baked them yourself! Make Martha Stewart's Artisan Boule from the Decorative Breads episode of Martha Bakes. Place a sheet of parchment on a pizza peel or unrimmed baking sheet and lightly dust with flour; set aside. On a lightly floured surface, repeat folding process to complete a second turn. Gather corners of dough and pinch together, then flip dough over, shaping into a tight ball. Transfer dough, seam-side down, to prepared pizza peel, adjusting shape as needed. Loosely cover with oiled plastic. Let stand in a warm spot until puffy and full of air, about 45 minutes. Lightly dust surface of bread with flour. Using an oiled razor blade or a very sharp knife, score surface in a decorative pattern. Working as quickly as possible, carefully slide parchment from peel onto pizza stone. Pull just enough of heated skillet out of oven to add ice before closing oven door. Bake until bread is deep golden brown and an instant-read thermometer inserted into center reads 205 degrees, 45 to 50 minutes. Transfer to a wire rack and let cool completely before serving.